Turning theory into practice. Today: combining formal pieces with casual wear. 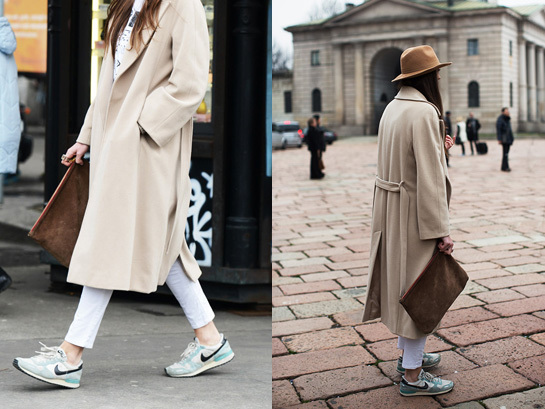 Hello Marzena, besides the Parka, this is exactly the kind of winter coat i want to invest next year! I hope you having a good week too! this the second beautiful sunny day over here! I see why and I wouldn’t mind to have the exact same coat in my closet as well. Me too! Such a great colourway, I’m sure those kicks look good with pretty much everything. I think they would look great with pretty much everything too! Which surprises me as I’m not drawn towards lighter colored sneakers- the two casual Nikes [even my Nike running shoes] I own are grey+charcoal grey and a deeper blue+olive pair. I know exactly what you mean. But I can assure you: once you have bought some colourful (or even bold) sneakers, there is no going back. I took the plunge last year and must say that they are far easier on the eye than I would have thought initially. Also you don’t get as easily tired of them as you might think.